Kadie Nugent is a recent graduate (2015) of the Kansas City Art Institute with a BFA in Fiber. 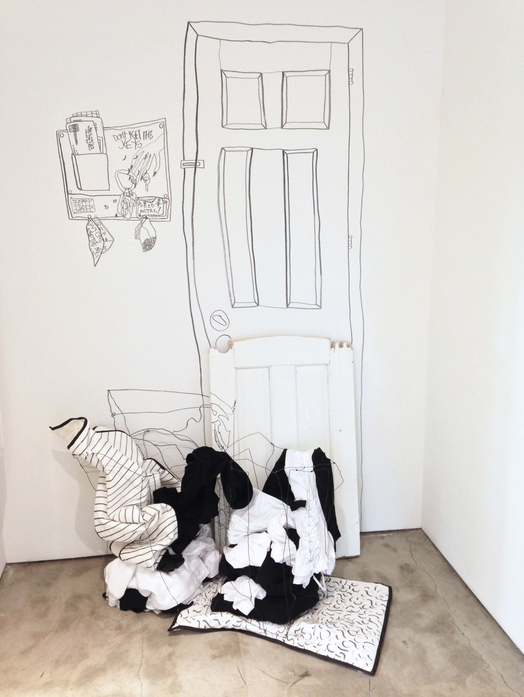 Her thesis exhibition Laundry Day was Last Week recreated her college bedroom in the basement gallery of The Leedy-Voulkos Art Center using primarily paper, drawn lines, and wire. This life-size installation included nearly 300 sq ft of hand drawn carpet. Since, Nugent has had the opportunity to collaborate with fellow resident Daiana Oneto at Paragraph gallery to create large-scale drawings on foam core and fabric to collage on the gallery walls in “What Will You Think Tomorrow?”.